Hello There! Well it is time for a another Raisin Boat Challenge and they have a new stamp set out that is perfect to use for this challenge. The set is called Happy Thanksgiving. The challenge this month is "Thankful" I didn't get to use this set on my card because I needed to do it before this was released. I used Thankful, Arboretum Leaves, and Growing Love and a fun background technique that I learned at Splitcoastampers called Alcohol Marker Marbling. Here are two cards I made. Challenge #28 Is titled, "Thankful"... Now is a great time to reflect on all that you are thankful for. 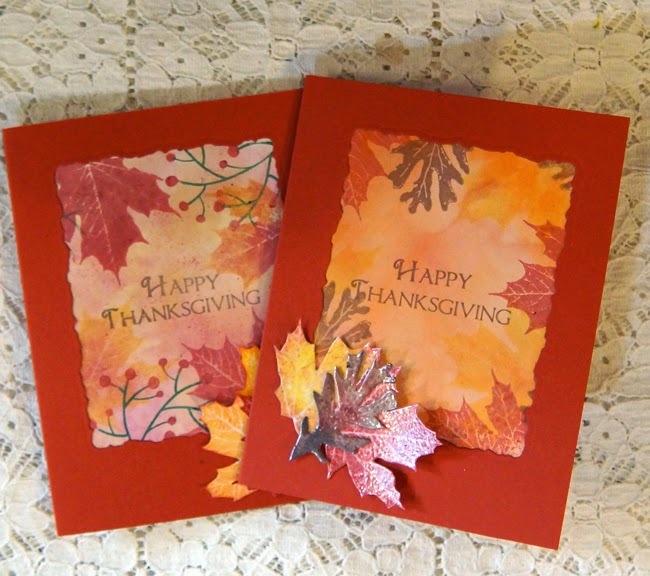 You can create a journal page, a scrapbook page, or cards to have on hand to show your appreciation for a kind act or gift, or place cards for your Thanksgiving dinner. This current Thankful challenge will close on the 12th of November. I hope you will share what you create. Thanks for stopping and happy crafting! This is a beautiful fall design, and I like the new set being released. Hi Linda thank you for visiting my blog and leaving me a comment. Linda these are beautiful the colours are so perfect for Autumn, love the stamps you have used, super make.